In electromagnetism, absolute permittivity, often simply called permittivity, usually denoted by the Greek letter ε (epsilon), is the measure of capacitance that is encountered when forming an electric field in a particular medium. More specifically, permittivity describes the amount of charge needed to generate one unit of electric flux in a particular medium. Accordingly, a charge will yield more electric flux in a medium with low permittivity than in a medium with high permittivity. Permittivity is the measure of a material's ability to store an electric field in the polarization of the medium. The SI unit for permittivity is farad per meter (F/m or F·m−1). The lowest possible permittivity is that of a vacuum. Vacuum permittivity, sometimes called the electric constant, is represented by ε0 and has a value of approximately 8.85×10−12 F/m. The permittivity of a dielectric medium is often represented by the ratio of its absolute permittivity to the electric constant. This dimensionless quantity is called the medium’s relative permittivity, sometimes also called "permittivity". Relative permittivity is also commonly referred to as the dielectric constant, a term which has been deprecated in physics and engineering as well as in chemistry. By definition, a perfect vacuum has a relative permittivity of exactly 1. The difference in permittivity between a vacuum and air can often be considered negligible, as κair = 1.0006. The standard SI unit for permittivity is Farad per meter (F/m or F·m−1). where the permittivity ε is a scalar. If the medium is anisotropic, the permittivity is a second rank tensor. In general, permittivity is not a constant, as it can vary with the position in the medium, the frequency of the field applied, humidity, temperature, and other parameters. In a nonlinear medium, the permittivity can depend on the strength of the electric field. Permittivity as a function of frequency can take on real or complex values. In SI units, permittivity is measured in farads per meter (F/m or A2·s4·kg−1·m−3). The displacement field D is measured in units of coulombs per square meter (C/m2), while the electric field E is measured in volts per meter (V/m). D and E describe the interaction between charged objects. D is related to the charge densities associated with this interaction, while E is related to the forces and potential differences. µ0 is the vacuum permeability. where χ (frequently written χe) is the electric susceptibility of the material. where ε0 is the electric permittivity of free space. The susceptibility is also related to the polarizability of individual particles in the medium by the Clausius-Mossotti relation. is a differential area vector on the Gaussian surface. represents the angle between the electric field vector and the area vector. ). This formula applies to the electric field due to a point charge, outside of a conducting sphere or shell, outside of a uniformly charged insulating sphere, or between the plates of a spherical capacitor. That is, the polarization is a convolution of the electric field at previous times with time-dependent susceptibility given by χ(Δt). The upper limit of this integral can be extended to infinity as well if one defines χ(Δt) = 0 for Δt < 0. An instantaneous response would correspond to a Dirac delta function susceptibility χ(Δt) = χδ(Δt). This frequency dependence of the susceptibility leads to frequency dependence of the permittivity. The shape of the susceptibility with respect to frequency characterizes the dispersion properties of the material. Moreover, the fact that the polarization can only depend on the electric field at previous times (i.e. effectively χ(Δt) = 0 for Δt < 0), a consequence of causality, imposes Kramers–Kronig constraints on the susceptibility χ(0). A dielectric permittivity spectrum over a wide range of frequencies. ε′ and ε″ denote the real and the imaginary part of the permittivity, respectively. Various processes are labeled on the image: ionic and dipolar relaxation, and atomic and electronic resonances at higher energies. i is the imaginary unit, i2 = −1. δ is the loss angle. The choice of sign for time-dependence, e−iωt, dictates the sign convention for the imaginary part of permittivity. The signs used here correspond to those commonly used in physics, whereas for the engineering convention one should reverse all imaginary quantities. The complex permittivity is usually a complicated function of frequency ω, since it is a superimposed description of dispersion phenomena occurring at multiple frequencies. The dielectric function ε(ω) must have poles only for frequencies with positive imaginary parts, and therefore satisfies the Kramers–Kronig relations. However, in the narrow frequency ranges that are often studied in practice, the permittivity can be approximated as frequency-independent or by model functions. At a given frequency, the imaginary part, ε″, leads to absorption loss if it is positive (in the above sign convention) and gain if it is negative. More generally, the imaginary parts of the eigenvalues of the anisotropic dielectric tensor should be considered. In this expression, Wc,v(E) represents the product of the Brillouin zone-averaged transition probability at the energy E with the joint density of states, Jc,v(E); φ is a broadening function, representing the role of scattering in smearing out the energy levels. In general, the broadening is intermediate between Lorentzian and Gaussian; for an alloy it is somewhat closer to Gaussian because of strong scattering from statistical fluctuations in the local composition on a nanometer scale. According to the Drude model of magnetized plasma, a more general expression which takes into account the interaction of the carriers with an alternating electric field at millimeter and microwave frequencies in an axially magnetized semiconductor requires the expression of the permittivity as a non-diagonal tensor. (see also Electro-gyration). If ε2 vanishes, then the tensor is diagonal but not proportional to the identity and the medium is said to be a uniaxial medium, which has similar properties to a uniaxial crystal. Materials can be classified according to their complex-valued permittivity ε, upon comparison of its real ε′ and imaginary ε″ components (or, equivalently, conductivity, σ, when accounted for in the latter). A perfect conductor has infinite conductivity, σ = ∞, while a perfect dielectric is a material that has no conductivity at all, σ = 0; this latter case, of real-valued permittivity (or complex-valued permittivity with zero imaginary component) is also associated with the name lossless media. Generally, when σ/ωε′ ≪ 1 we consider the material to be a low-loss dielectric (although not exactly lossless), whereas σ/ωε′ ≫ 1 is associated with a good conductor; such materials with non-negligible conductivity yield a large amount of loss that inhibit the propagation of electromagnetic waves, thus are also said to be lossy media. Those materials that do not fall under either limit are considered to be general media. ε′ is the real part of the permittivity. 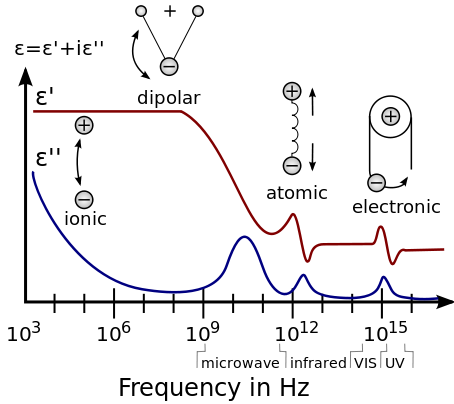 The size of the displacement current is dependent on the frequency ω of the applied field E; there is no displacement current in a constant field. First are the relaxation effects associated with permanent and induced molecular dipoles. At low frequencies the field changes slowly enough to allow dipoles to reach equilibrium before the field has measurably changed. For frequencies at which dipole orientations cannot follow the applied field because of the viscosity of the medium, absorption of the field's energy leads to energy dissipation. The mechanism of dipoles relaxing is called dielectric relaxation and for ideal dipoles is described by classic Debye relaxation. Second are the resonance effects, which arise from the rotations or vibrations of atoms, ions, or electrons. These processes are observed in the neighborhood of their characteristic absorption frequencies. The above effects often combine to cause non-linear effects within capacitors. For example, dielectric absorption refers to the inability of a capacitor that has been charged for a long time to completely discharge when briefly discharged. Although an ideal capacitor would remain at zero volts after being discharged, real capacitors will develop a small voltage, a phenomenon that is also called soakage or battery action. 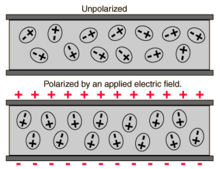 For some dielectrics, such as many polymer films, the resulting voltage may be less than 1–2% of the original voltage. However, it can be as much as 15–25% in the case of electrolytic capacitors or supercapacitors. In terms of quantum mechanics, permittivity is explained by atomic and molecular interactions. At low frequencies, molecules in polar dielectrics are polarized by an applied electric field, which induces periodic rotations. For example, at the microwave frequency, the microwave field causes the periodic rotation of water molecules, sufficient to break hydrogen bonds. The field does work against the bonds and the energy is absorbed by the material as heat. This is why microwave ovens work very well for materials containing water. There are two maxima of the imaginary component (the absorptive index) of water, one at the microwave frequency, and the other at far ultraviolet (UV) frequency. Both of these resonances are at higher frequencies than the operating frequency of microwave ovens. At moderate frequencies, the energy is too high to cause rotation, yet too low to affect electrons directly, and is absorbed in the form of resonant molecular vibrations. In water, this is where the absorptive index starts to drop sharply, and the minimum of the imaginary permittivity is at the frequency of blue light (optical regime). At high frequencies (such as UV and above), molecules cannot relax, and the energy is purely absorbed by atoms, exciting electron energy levels. Thus, these frequencies are classified as ionizing radiation. While carrying out a complete ab initio (that is, first-principles) modelling is now computationally possible, it has not been widely applied yet. Thus, a phenomenological model is accepted as being an adequate method of capturing experimental behaviors. The Debye model and the Lorentz model use a first-order and second-order (respectively) lumped system parameter linear representation (such as an RC and an LRC resonant circuit). The relative permittivity of a material can be found by a variety of static electrical measurements. The complex permittivity is evaluated over a wide range of frequencies by using different variants of dielectric spectroscopy, covering nearly 21 orders of magnitude from 10−6 to 1015 hertz. Also, by using cryostats and ovens, the dielectric properties of a medium can be characterized over an array of temperatures. In order to study systems for such diverse excitation fields, a number of measurement setups are used, each adequate for a special frequency range. Various microwave measurement techniques are outlined in Chen et al.. Typical errors for the Hakki-Coleman method employing a puck of material between conducting planes are about 0.3%. At infrared and optical frequencies, a common technique is ellipsometry. Dual polarisation interferometry is also used to measure the complex refractive index for very thin films at optical frequencies. ^ Current practice of standards organizations such as NIST and BIPM is to use c0, rather than c, to denote the speed of light in a vacuum according to ISO 31. In the original Recommendation of 1983, the symbol c was used for this purpose. ^ IEEE Standards Board (1997). "IEEE Standard Definitions of Terms for Radio Wave Propagation". p. 6. ^ Braslavsky, S.E. (2007). "Glossary of terms used in photochemistry (IUPAC recommendations 2006)" (PDF). Pure and Applied Chemistry. 79 (3): 293–465. doi:10.1351/pac200779030293. ^ NIST Special Publication 330, Appendix 2, p. 45 . ^ "Latest (2006) values of the constants (NIST)". Physics.nist.gov. 2017-07-01. Retrieved 2018-11-20. ^ "Dielectric Spectroscopy". Retrieved 2018-11-20. ^ Peter Y. Yu; Manuel Cardona (2001). Fundamentals of Semiconductors: Physics and Materials Properties. Berlin: Springer. p. 261. ISBN 978-3-540-25470-6. ^ John H. Moore; Nicholas D. Spencer (2001). Encyclopedia of chemical physics and physical chemistry. Taylor and Francis. p. 105. ISBN 978-0-7503-0798-7. ^ Solé, José García; Bausá, Louisa E; Jaque, Daniel (2005-03-22). Solé and Bausa. p. 10. ISBN 978-3-540-25470-6. ^ Hartmut Haug; Stephan W. Koch (1994). Quantum Theory of the Optical and Electronic Properties of Semiconductors. World Scientific. p. 196. ISBN 978-981-02-1864-5. ^ Manijeh Razeghi (2006). Fundamentals of Solid State Engineering. Birkhauser. p. 383. ISBN 978-0-387-28152-0. ^ John S. Seybold (2005), Introduction to RF Propagation, John Wiley & Sons, p. 22, eq. (2.6). ^ Kenneth L. Kaiser, Electromagnetic Shielding, CRC Press, 2005, p. 1·28, eqs. (1.80) and (1.81). ^ Linfeng Chen; V. V. Varadan; C. K. Ong; Chye Poh Neo (2004). "Microwave theory and techniques for materials characterization". Microwave electronics. Wiley. p. 37. ISBN 978-0-470-84492-2. ^ Mailadil T. Sebastian (2008). Dielectric Materials for Wireless Communication. Elsevier. p. 19. ISBN 978-0-08-045330-9. C. J. F. Bottcher, O. C. von Belle & Paul Bordewijk (1973) Theory of Electric Polarization: Dielectric Polarization, volume 1, (1978) volume 2, Elsevier ISBN 0-444-41579-3. Arthur von Hippel editor (1966) Dielectric Materials and Applications: papers by 22 contributors ISBN 0-89006-805-4.